Hooray! In this rather depressing area of flat fields cowering from the A47, and locked churches defending themselves against pilgrims and strangers, this was the first of the day that we were actually able to get into. A notice outside offered visitors a go at the key, and I went across to the village shop to collect it. When I asked for it, the pleasant, mild-mannered shopkeeper asked me what my name was. I thought he might want to write it down, but he had no pen or anything; he just waited expectantly. So I told him. I half expected him to turn to a list on the wall and say "I'm terribly sorry, Mr Knott, but you are on the Diocesan blacklist of people who aren't allowed the key". But he didn't, and two minutes later we were inside. As you can see from the picture above, something rather drastic has happened here, as a result of a fire on the night of December 15th 1891. As the splendid History of Great Plumstead by Richard Hale, available inside the church for £1, remarks, it was one of the most eventful happenings in village history. So fierce was the fire that absolutely everything east of the tower was destroyed, except for the brasses of course, because they had been sensibly left on the floor rather than being remounted on the walls. We had just come from Bixley, which had experienced a similar inferno only a year ago, and the floor-mounted brass there had survived as well. The tower is early 18th century, replacing one that fell, and clearly designed with recreational bell-ringing in mind. The knapped flints used to line the walls of the nave and chancel are rather unfortunate, making the body of the church look like a cemetery chapel, so thank goodness for the warmth of the tower. I have no idea who the architect was, but in any case the interior speaks as much now of a thorough-going redecoration it had, probably in the 1960s judging by its Festival of Britain crispness. All the floortiles and the brasses were lacquered, all the benches brightly varnished, all the windows are now full of white light. I rather liked it - on this cold day it seemed to hold a friendly warmth. This is, to all intents and purposes, a Victorian church, but there are a few survivals of its earlier days. The two medieval brasses are in the nave, there is a strangely antiseptic opening to the rood loft stair on the north side of the chancel, and the outline of what must have been a five light Early English window at the east end. 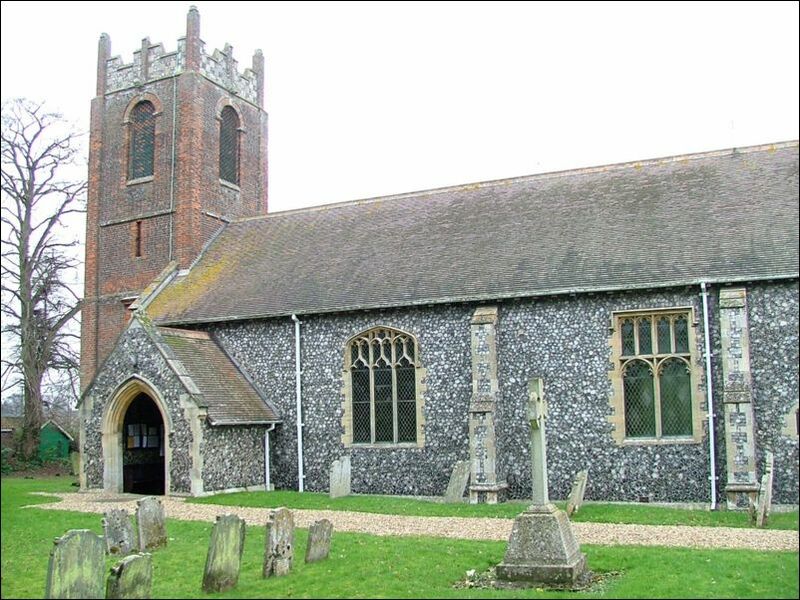 As the revised Pevsner observes in a rare moment of intuition, the church here must have been very like that at nearby Acle before the rebuilding. The great loss of the fire was the medieval screen - drawings show fine panels of St Benedict, St Martin, St Dunstan and St Giles. But of course it was completely incinerated. A precious post-fire survival is the original WWI roll of honour, still on show in the church, a rare thing to find nowadays. The young men, many of whom must have witnessed the church fire as children, were recorded on on the roll by the Rector as they marched off to death and, when the dreadful news came through, an asterisk was placed against their name to show that they had been killed. One poignant moment is captured forever where, against one young man, the hopeful Rector has written missing - but this has later been neatly crossed out, and an asterisk squeezed in beside it. Heartbreaking.